Quick list of highly probable or confirmed UFO hoaxes and myths: Ray Santilli "Roswell alien autopsy" film (1995), Bob Lazar (supposedly worked on UFO back-engineering project at "S4" Area 51 in Nevada USA, bogus UFO propulsion physics involving Element-115 aka Ununpentium), John Searl (claims to have flown what he called an IGV -Inverse Gravity Vehicle- in England during the 1960s), TNT's "KGB UFO Files" alien autopsy video and film of half-buried discoid UFO which supposedly crashed in 1968 in Sverdlovsk (Berezovsky) Russia, Project SERPO (alleged top-secret exchange program between the US government and an alien planet called Serpo), Project Bluebeam (conspiracy theory aimed at Christian fundamentalists since the 1990s), UMMO (hoax spread mostly in Spain & France in the 1960s and 1970s, decades-long claims that aliens from the planet Ummo were communicating with persons on Earth), Pleiadians (one-armed Swiss farmer Billy Meier), Nazi flying saucers (Nick Cook), Space-Nazis, Youtube videos of UFO over Haiti and Dominican Republic, WTC helicopter UFO video (SciFi channel promo), California / Raji drones (May/Jun-2007) and followup Isaac's CARET Program and Extra-Terrestrial Technology (Jun-2007), "Men in Black" mythology by Gray Barker (USA 1950s and 1960s), Shaver mystery (underground civilizations, USA 1950s), alleged TR3B "black-project" craft to explain the silent massive "black triangles" seen all over the world, Russian "Cosmospheres" to explain spherical UFOs, Jonathan Bradley Rutter a.k.a "Dr" Jonathan Reed ("Alien in forest encounter in Oct-1996" - story about encountering reptilian alien in the woods of the Cascade Mountains, alien attacked his dog, he killed the alien and put it in freezer), "Australian UFO wave" hoax of 2006 (by Chris Kenworthy). Project Blue Beam (3-dimensional holographic projection of 'Jesus' in the sky). Photography issues: "orbs" (backscatter orbs) and "rods". Only a tiny minority (<5% per the Colorado University 1969 study of the USAF Project Blue Book files a.k.a. "Condon Report") of UFO reports turn out to be deliberate hoaxes (a great deal more are honest misidentifications of mundane objects or phenomena). Yet widely publicized hoaxes challenge the credibility of all sightings. They can also call into question the diligence of UFO organizations. At the height of the "UFO fever" of the 1950s, hoaxes were perpetrated mostly by teenage boys with a camera and a good throwing arm. These might more properly be termed pranks. In 2006 and 2007, several computer-generated images and videos have surfaced; such UFO-art includes the "Australian UFO wave 2006" series of 31 videos by Chris Kenworthy funded by Australian Film Commission, the "Chad drones" a/k/a "California drones" and close-up videos of supposed UFOs over Haiti and Dominican Republic, featured on Youtube's front-page and attracting millions of viewers and raving reviews (4.5 of 5 stars). However, a more sinister kind of hoaxing has taken hold in America, which seems to involve the intelligence establishment of the United States (e.g. a serious semi-officially acknowledged elaborate hoax, on-going over years, was played on Dr.Paul Bennewitz, an engineer-businessman and UFO researcher in Albuquerque NM). The shameless disinformation fed to the general public via the mainstream media (even those popularly considered credible, e.g. the PBS-TV NOVA "UFOs: Are we alone?" in 1982, the "BBC Inside Out" promoting the Conde police car practical joke, in an attempt to discredit the Rendlesham forest UFO incident of 1980, or the recent National Geographic Channel "Is it real?" series of mockumentaries on UFOs/Aliens, crop-circles, Chupacabras etc, which quite frankly were the most egregious pieces of disinfo I've seen produced in this decade sofar and sent chills up my spine wondering how much BS we're being fed in subjects where one isn't knowledgeable and/or alert to catch it as such) also continues unabated. ... "bury public interest in UFOs by confounding the curious with an array of increasingly outrageous and incredible tales which sap their strength, drain their resources and strain their reputations to the point where they will either stop digging or dig only in carefully fenced-off, perfectly harmless places." Ray Santilli fake "Roswell Alien Autopsy film" and "Roswell crash wreckage" videos aired in 1995, are a confirmed hoax (see Eamonn investigates "Alien Autopsy" 2002 TV documentary or quick summary of Eamonn on Santilli hoax and comments by Philip Mantle) and Kiviat on AA film. Santilli changed his story in 2002 and admitted to have filmed a dummy alien, created by sculptor and special-effects designer John Humphreys. The organs were made from sheep and chicken offal, the leg injury made use of a sheep bone joint. The set was a terraced house in Camden Town, London. The actors included Santilli, Shoefield, Humphreys, and one of Shoefield's employees, Gareth Watson. Santilli claimed to have done a "restoration", as the supposedly original film footage was worn out and practically unusable, but it is practically certain that the entire affair was a hoax and Santilli doesn't admit it to avoid fraud charges. Note that the "Roswell UFO crash" incident in 1947 was almost certainly NOT a "Mogul baloon" as claimed by officialdom, but the Santilli autopsy film hoax was an attempt to "exploit", to capitalise (make $$$ money) on the public's interest in the UFO phenomenon. Only "consolation" would be, as Stanton Friedman -who correctly refused to accept it as authentic from the beginning- put it: "Because of that footage that has been shown in 32 countries there has been a great deal of public discussions about UFOs that would otherwise not have occurred." 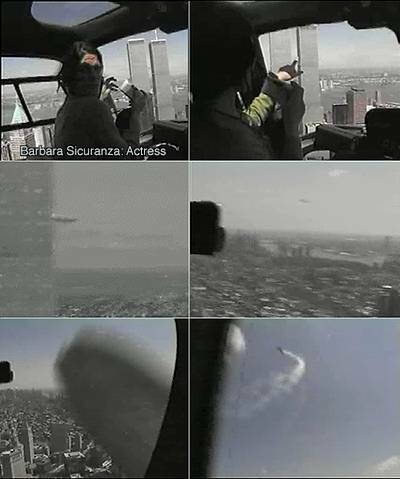 Video footage of UFO "buzzing" helicopter near WTC (*not* the case on 9/11), is simply an ADMITTED computer-graphics (CGI) promotional commercial clip for Sci-Fi channel! Other telltale signs would be that the "UFO" leaves a contrail. Read email by actress Barbara Sicuranza who played in it. Bob Lazar UFO physics (see discussions at Lazar corner) Ununpentium-115 superheavy element, gravity waves type A and type B. I could potentially believe (based on his name being listed in Los Alamos National Laboratory 1982 phone book and his tax return slip citing payment from Department of Naval Intelligence) that Lazar has worked at S4 / Area-51 and even has seen flying saucers as he claims, but his "flying saucer physics" with element Uup-115 creating a "gravity A wave" which extends outside the nucleus and then amplified and "out of phase gravitational waves" etc, I find impossible. Critiqued by David Morgan and Friedman. Mexico's military airforce FLIR footage, caught on infrared. Rather convincingly explained to be oil-well fires across the horizon. Some of LtCol. Philip J. Corso's claims in his book "The Day after Roswell". For those who don't know the background, it is claimed that he Corso, working in Pentagon's Foreign Technology Division in 1960s fed alien technology from the crashed Roswell UFO debris to US industries for back-engineering, thus developing technologies such as: the microchip, fiber optics, Kevlar, laser weapons, night-vision (image intensifiers) etc. Perhaps SOME of his story is true. I am inclined to think he overstated his role. Read opinions on Corso by Friedman, Sparks. On the other hand, former Canadian Minister of Defense (1963-1967) Paul Hellyer endorses the validity of Corso's statements, having verified them with a US General who told him "everything (Corso said) is true and then some". SERPO Project about a supposed top secret exchange program of twelve US military personnel to Serpo, a planet of Zeta Reticuli, between the years 1965-78. A more detailed List of discredited UFO sightings from *U* UFO Database by Larry Hatch. Note however that I disagree on some cases, e.g. the 1976 "UFO cross" by 2 British policemen and the T.Fogl 1957 photographic case (who recently retracted his hoax admission). Ed Walters, Gulf Breeze Florida. I'll side with Dr.Bruce Maccabee, who studied the case closely (ref: MUFON Journal Apr-1989). There are many more "stories"/hoaxes/etc by the fringe element in UFOlogy, which unfortunately serves to murky the waters and possibly discredit the entire subject in the mind of the general public who can't easily tell between fact and fiction. Websites such as www.ufowatchdog.com and www.ufoencounters.co.uk further explore the facts, myths and frauds about UFOs.